A delight to use. Same blade speed as the Lister® Stablemate™ but rare-earth permanent magnet motor delivers far more torque (power) to the blades. Use with our large blade sets. Quieter. 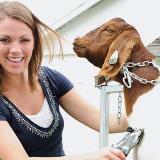 Less motor "whine", kind to your ears and less likely to upset animals. Permanent rare-earth magnet motor enable more torque (power) and require less space and weight than ordinary motors. Less heat is produced by the permanent magnet motor and the fan forces air forward through our heads—so the heads run 20° F cooler. Up to 20% shorter in length than other motors. Weighs up to 15% less than other motors. Smaller grip than other motors. Sleek, low-profile ribs makes it easier to grip the tension knob. Shorter tension bolt equals fewer turns needed to reset tension, so you spend less time changing and tensioning blades. Internal roller bearings instead of bushings (less heat, less wear and greater longevity). Stainless steel inserts that are riveted in reduce the possibility of the inserts becoming loose. Round steel drive in place of a plastic bushing makes fitting the top blade easier. Includes 2 screws for attaching to motor. Motor has a 16 ft electrical cord. 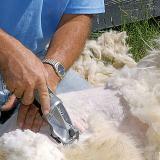 Only 3 minutes to change a clipper head to shear head. 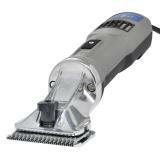 Will drive Premier and Lister® clipper blades. Rarely slows down under load. Plows through fiber. Drives shear head with equal power. 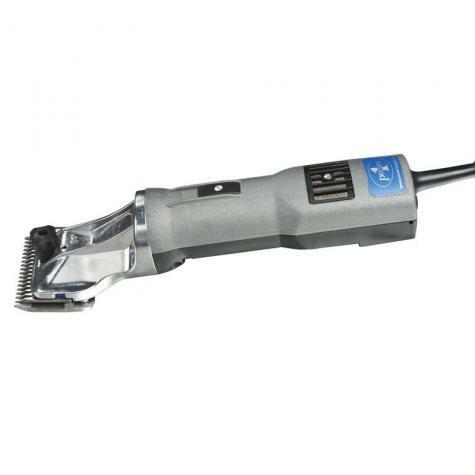 Motor is smaller in size, lighter in weight and shorter in length than any other large clipper. See our videos and printable instructions above. We are no longer converting machines to 220v. Failure to oil as often as recommended may lead to excess heat and premature wear and tear. Warning: Unlike some other clipper motors, this motor will neither slow down nor sound different when oil is needed. But failure to oil will quickly cause damage to the blades and drive head. So you MUST apply oil by time instead of sound. Apply a small amount of oil every 3 minutes to the tips of the teeth and each side of the blade by dipping them into a dish of oil or pouring oil directly onto the teeth with a small oil container and every 10 minutes drip oil into the small hole behind the tension knob assembly. Excessive wear can occur if not oiled properly! Covers all labor and parts for 3 years from the date of purchase. 2 years longer than any competing unit! Warranty includes shipping to and from Premier (via $12 freight reimbursement on a Premier machine under warranty). Abuse (e.g. dropping it) and neglect (e.g. failure to oil frequently enough) are not covered. Recommended: 49 out of 49 said they would recommend this product to a friend. 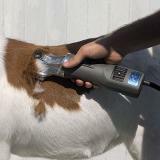 I recently purchased these clippers and hacecurrently clipped 4 animals. They are great! They make short work of clipping. The blades dont leave clipper lines or dig like the oster blades I am used to. Also these clippers are far lighter tha Andis and oster.my one and only complaint is that they are quite loud but after the animals get used to the noise they are fine. I was researching between these and Lister Star. Both are quality brands. I chose these because of the three year warranty. 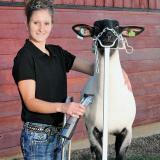 They are light and small enough for our daughter to use for sheering her shownlambs. We are very pleased with them and how well they worked yesterday. Glad I decided on these. 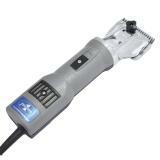 Just got the clippers that I ordered today. Went right to the barn to 'de-hair' the Mule. 'Ace is 23 & his hair has killed 5 Oster clippers over the years. Granted, not all those clippers were brand new when we got them. 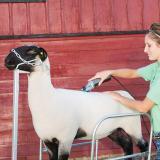 Mules have a long coat with an soft undercoat; We have clipped this mule since he was two years old. He never sheds out like the horses; mule self preservation - he thinks the ice age is coming. 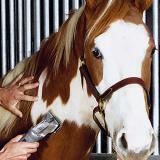 The Premier 1 clippers handled everything - long hair, soft fuzzy hair, face, mane & tail. 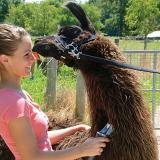 Light & balanced in the hand & vibration didn't bother the mule, even next to his ears. The blades got their oil but 3 minutes goes by fast when you're getting a great body clip. Ace has his clock too & I got him done before it ran out. Just love these clippers! 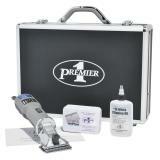 I have never used clippers and was unsure of the blades that I would need for the job but after the wonderful assistance that Premier1 provided I felt confident about what I was purchasing and excited to give them a try. These clippers made the chore easy and fun. 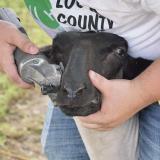 The lambs that I practiced on were not so happy about being bathed, but calmed right down as soon as I started using the clippers(I almost think they enjoyed it). I wish I had bought these years ago. So much lighter and easier to use. You must keep them oiled but thats fine with me. I trace clip my horses and put fun designs on them in the winter and these are perfect. They are not quiet, but really, they not any louder than my blue ones were, but these run better and are half the weight.